Non-Invasive Archaeology in the Republic of Moldova — an example of multidisciplinary approach and international partnership. Musteata et al. Internet Archaeol. 43. Over the last few decades a wide array of new non-invasive techniques has been available for archaeological research, particularly since the use of non-destructive archaeological research methods fits perfectly in the context of the international conventions and recommendations. These include 'Recommendation on international principles applicable to archaeological excavations, UNESCO, 1956', the Valletta Convention (the revised European Convention on the protection of the archaeological heritage, 1992) and 'Guidelines for protection of the archaeological heritage' (2011), etc. The ICOMOS Charter for the Protection and Management of the Archaeological Heritage [pdf] (1990) mentions 'Non-destructive techniques, aerial and ground survey, and sampling should therefore be encouraged wherever possible, in preference to total excavation'. Non-destructive methods involve a multidisciplinary approach and a wide range of techniques by means of which we can explore archaeological sites without disturbing the ground. These methods include ground-based geophysical techniques and remote sensing techniques: Earth Resistance and Ground Penetrating Radar (GPR), Electrical Resistivity Imaging (ERI), Low Frequency Electromagnetic (LFEM), Magnetic Susceptibility, acoustic, magnetometer, Light Detection and Ranging (lidar), etc. (Schmidt et al. 2015). With this in mind, this article discusses the techniques used by various archaeological teams in the Republic of Moldova. The history of magnetometry starts in the 1950s, pioneered by Martin Aitken and Edward Hall from Oxford. These two English researchers were involved in rescue interventions in the Peterborough area, in advance of the building of a motorway segment, seeking to pinpoint the Roman pottery kilns from this area. The work that took place in 1958 is considered the starting point of the use of magnetometry in archaeology. The distance between points was 1.5×1.5m, so that an area of 5ha required one week of work. At the end of the week it was possible to identify a pottery kiln, meeting the aims of the search (Aitken 1961). 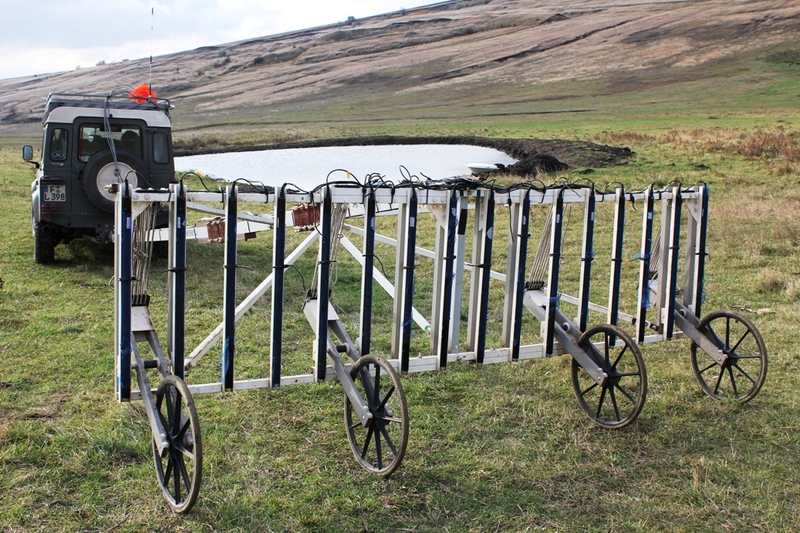 One of the first non-invasive surveys in our region was done in 1974 by V.P. Dudkin using an 'M 27' magnetometer on a prehistoric site (Dudkin and Videkko 2004). After that, most non-invasive archaeological research was limited to field surveys. 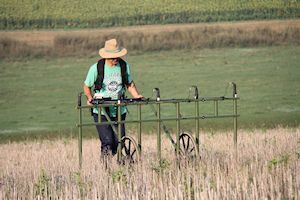 Not until 2005, with the participation of colleagues from the Free University of Berlin, was another magnetometer survey done, on the Bronze Age site from Miciurin–Odaia. The results published show that the geomagnetic research did not reveal anomalies of anthropic origin (Keiser and Sava 2006). The situation changed during the last decade, as a result of a number of international partnerships and projects. Since 2009, the 'Ion Creangă' State Pedagogical University from Chișinău and the National Association of Young Historians of Moldova, in partnership with the German RGK, Frankfurt am Main, Germany, the National Museum of the Eastern Carpathians in Sf. Gheorghe, Romania, and the 'Al. Cuza' University of Iași, Romania, conducted several non-invasive surveys in the Republic of Moldova. Most consisted of magnetometric surveying in prehistoric, Late Antiquity and medieval sites, yielding impressive discoveries. As a method of archaeological research, magnetometry relies on interpreting the contrast between the values of the magnetic field of the soil surface at a certain point, and those of the earth's natural magnetic field. This difference allows magnetic anomalies to be highlighted, which indicate the existence of below-ground structures of natural or anthropic origin. Used alongside other research methods, magnetometry allows a much more efficient recognition of underground archaeological remains, up to a depth of c.2m. A very active participant during the last decade in organising and conducting such non-invasive research has been the 'Ion Creangă' Pedagogical State University from Chișinău. 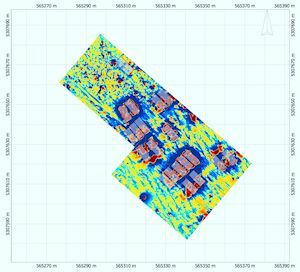 Thus, with the support of the German Institute of Archaeology in Frankfurt am Main, the first geophysical surveys were carried out in 2009–2011. Besides established researchers-archaeologists, the surveys also involved MA and PhD students from the Faculty of History of the above-mentioned university. At the same time, a theoretical-practical course was held in Chișinău for MA students, concerning non-destructive research methods in modern archaeology. Using a 5-probe magnetometric and ancillary equipment, all provided by the German partner, the possibilities as well as the limitations of this technology were demonstrated (Figure 1). 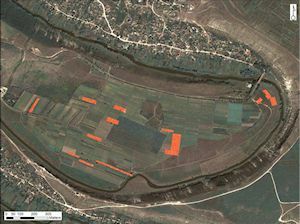 During the October 2009 stage, surveys were undertaken in five archaeological sites from the Republic of Moldova, namely in the villages of Horodca and Costești (Ialoveni district), Petreni (Drochia district), Sobari (Soroca district), and Trebujeni (Orhei district) (Popa et al. 2010a). It was possible to take geomagnetic readings for an area of over 20,000m², leading to the discovery of the remains of habitation structures and fortification works. Particularly interesting results were obtained, for instance, in the Cucuteni-Trypillia site located between the villages of Petreni and Sofia (Drochia district), and in the late Roman settlement from Sobari (Soroca district). In other cases, it was possible to identify several magnetometric anomalies that, on account of their shape and size, can be assigned to remains of dwellings. The field surveys carried out at the same time with the geomagnetic survey confirmed the possibility that the site extends over an area of more than 36 ha. The surface presents numerous concentrations of pottery fragments and burnt daub. The results provided sufficient conditions for a complete geomagnetic investigation, which was carried out during the 2010 and 2011 campaigns. Supplementary research was carried out in 2011 by Knut Rassmann from the Roman-Germanic Commission Frankfurt am Main. The geomagnetic readings in Soroca focused partly on the area inside the enclosure, currently not used for agriculture, as well as on the area south of it. Surveying was not possible in the south-western corner of the enclosure because of the thick shrubs present in that part of the site. Similarly, the areas previously investigated by E. Rikman and I. Niculițã were not investigated owing to the deep depressions caused by the trenches. In total, an area of c.10,000m² was investigated in Sobari. The image obtained from the investigations (Figure 2) confirmed E. Rikman's previous considerations on the interior organisation of the settlement and on the arrangement of the structures. The remains of three sides of the stone enclosure from the north-western part of the site are relatively clear. New information revealed by the investigations show at least three structures, probably of wood with clay daubing. 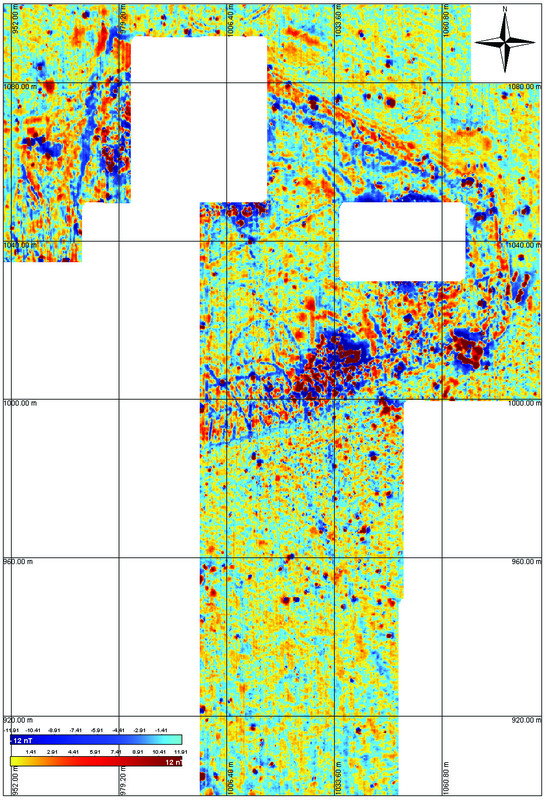 The final processing of the image obtained, and particularly the extension of the investigations for the entire area of the site during the campaigns to come, makes us hopeful that we will be able to use magnetometric surveys to obtain the complete image of the settlement and eventually of the associated necropolis. The Moldo-German team used a 'Fluxgate' installation composed of five probes, type 'Dr Förster'. The probes were placed on a non-magnetic mobile support, developed and assembled by Sensys Company in Germany. The distance between the probes was 0.50m, so that simultaneous measurements can be made on a strip 2.50m wide. The distance between the points measured by each probe was 0.05m. The speed of propulsion of the carriage varied from 0.6 to 1.2 m/s. Magnetometric probes measure the vertical component of the magnetic field beneath them, with a margin of error of about 0.5 nT. The power of depth penetration depends on several factors, especially the size of the objects sought, so that strong anomalies can be distinguished even when relatively deep. 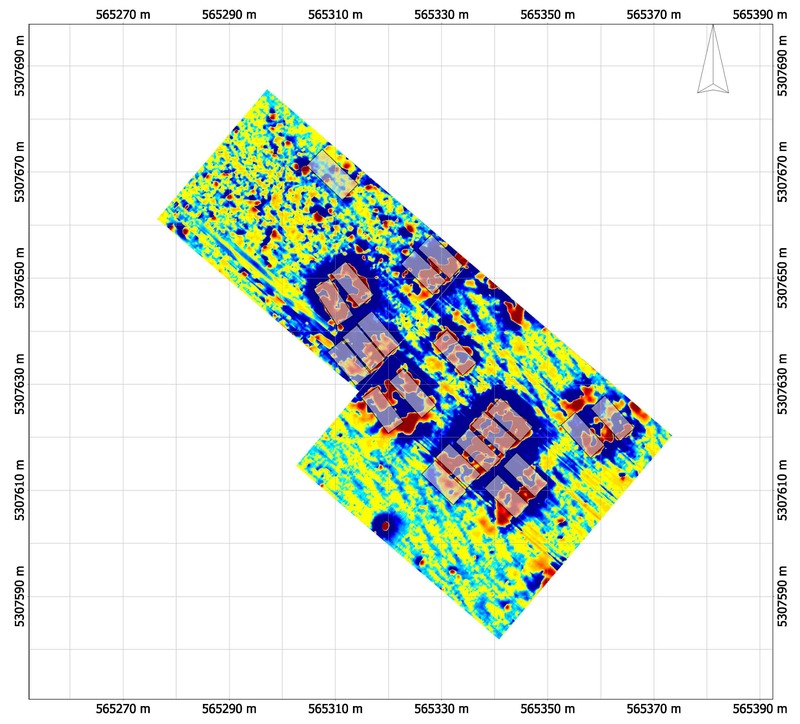 Magnetometer mapping was carried out in a rui rectangular grid. The absolute coordinate of their position was determined using a geodetic GPS, type Leica GS10. Coupled with a correction signal from MoldPos, the system provides an accuracy fluctuating between 2 and 4cm. The data acquired were stored in the national system of coordinates 'MOLDREF99', as required by law. 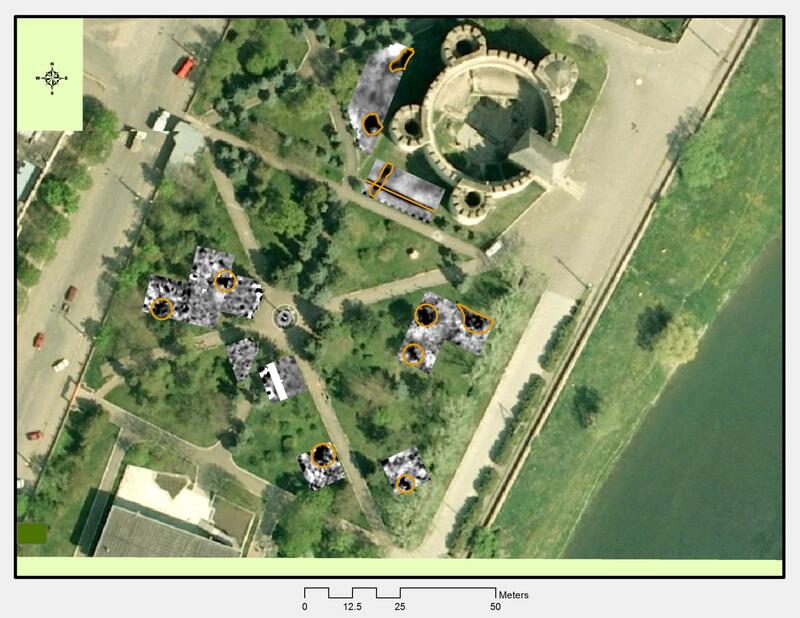 In 2010, the German Institute of Archaeology provided the team with an even more advanced magnetometer, comprising 16 channels of the 'Dr Förster' type (Figure 3). The probes were set on a non-magnetic carriage made and assembled by Sensys, and towed by an off-road vehicle. The distance between the probes was 0.25m, thus covering a 4m-wide strip. The speed of propulsion varied between 0.6 and 15km/h. 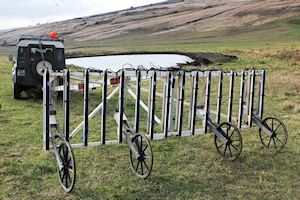 This equipment was used for geomagnetic surveys in a number of pre- and proto-historical sites, as well as in the medieval town from near Trebujeni, Orhei district. From the point of view of the development of the research method, particularly encouraging are the results of the investigations in 'Orheiul Vechi', where an area of c.1.0ha was covered, south of the enclosure of the so-called stone citadel. 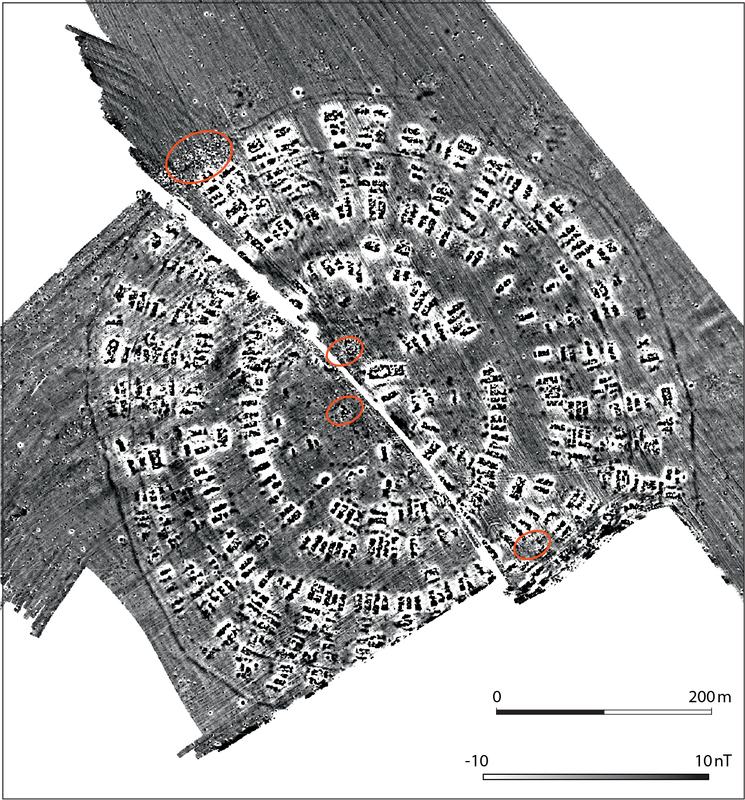 Unlike the investigations of the 2009 campaign, which took place inside the enclosure, in this case it was possible to distinguish a number of magnetic anomalies under the present-day ground level that indicate the existence of various buildings dating from the medieval period. The scale at which it is possible to carry out the respective investigations (c.20 ha/day) and, respectively, the magnetic susceptibility of the surface of the lost medieval town, are the decisive factors for employing magnetometry in planning and managing the future research on this site of international relevance (Figure 4). Extensive geomagnetic surveys were carried out in the site from Sângerei (Sângerei district), characterised on the surface by the presence of Cucuteni-Trypillia and Sântana de Mureș-Chernyakhov archaeological remains. More than 20ha were investigated here, which confirmed the conclusion advanced on the basis of the surface materials about the existence of two archaeological sites, from the Eneolithic and the Late Roman periods respectively. Thus, in the southern part of the promontory a series of anomalies were identified arranged in concentric rows (Figure 5), which, on the basis of analogies from the settlement of Petreni (Drochia district), can be interpreted as Cucuteni-Trypillia dwellings. Besides the 'small' dwellings, elongated anomalies measuring 6×15m were also discovered, probably either a large structure or two conterminous smaller ones. From the distribution of the surface archaeological material, we estimate the size of the settlement at c.7 ha. In the opposite part of the promontory, an elongated geomagnetic anomaly was discovered, which can be interpreted as a stone building with a length of c.28m. The structure can be linked to the Sântana de Mureș-Chernyakhov remains collected from the surface of the site. Some of the smaller magnetic anomalies can be interpreted as burial pits. This hypothesis is set to be verified by more extensive interdisciplinary research. Particular attention was given to the investigations in the settlement from Petreni. On account of the scientific potential proven by the 2009 investigations, more than 14ha of the site were surveyed (Figure 6). The area surveyed in 2010 represents approximately half of the settlement, the research of which started more than a century ago. 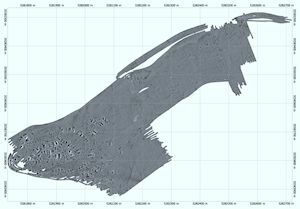 The size of the settlement was previously estimated on the basis of air photographs and by charting the surface remains. The northern half of the settlement was occupied in 2010 by winter crops, preventing its investigation. 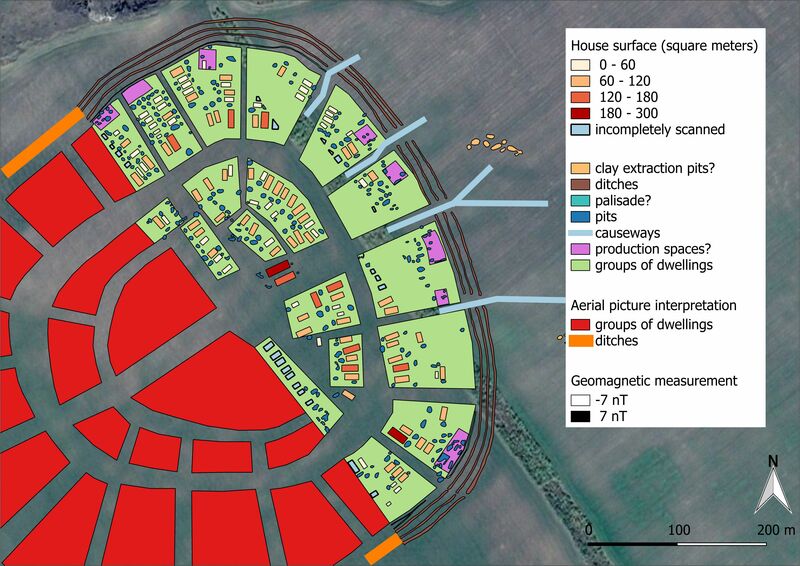 The magnetometric plan of the site from Petreni unequivocally indicates human occupation, with structures arranged in concentric lines, grouped around a central sector. The high quality of the image processed on the basis of the measurements in Petreni is due to the large quantity of burnt clay from the remains of the Eneolithic dwellings. 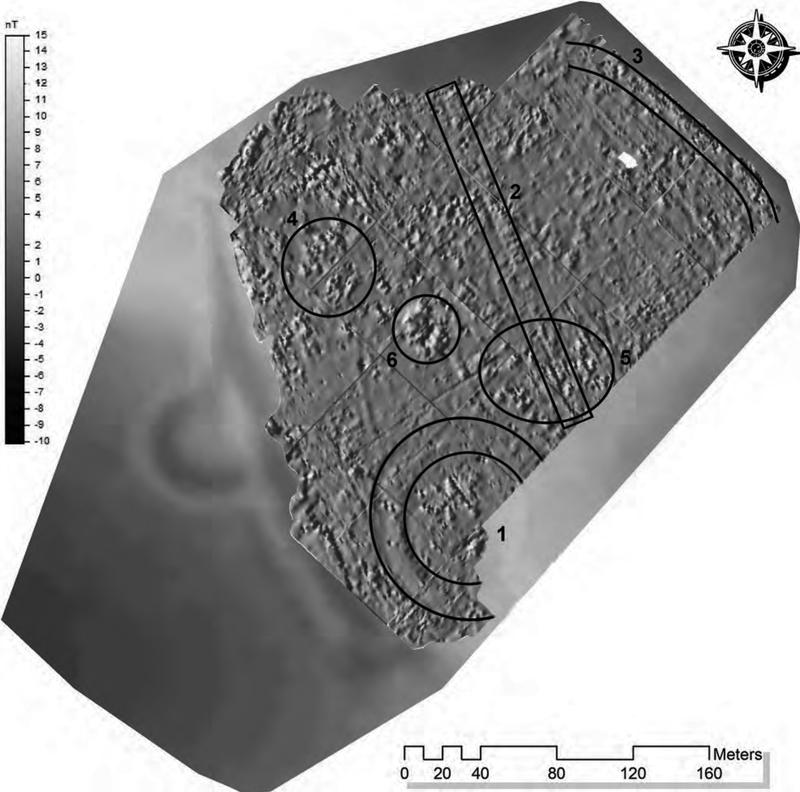 An important result of the 2010 investigations is the discovery of a large semi-circular anomaly that surrounds the cluster of dwellings, interpreted as the palisade ditch that enclosed the settlement. Less visible traces of a ditch are found in the presumed central part of the settlement. To conclude, we can state that the geomagnetic investigations in Petreni (Drochia district) prove once again the reliability of this method for investigating the internal structure of Eneolithic sites, which preserve the remains of wooden structures with clay daubing. The remains of the settlement seem to be well preserved, and the site is easily accessible; this situation was confirmed by recent archaeological excavations. The land on which it sits is used for agricultural purposes by the collective farm of the village of Sofia, Drochia district, but unlike in other sites, its surface is not set out in farmer lots. The geomagnetic surveys of 2010 clearly confirm the scientific importance and potential of the site, which at this moment, on account of the state of preservation and the potential of scientific exploration, is unique in Europe. The future interdisciplinary research could bring to light other evidence of the Eneolithic occupation in the Central Moldavian Plateau in particular, and the Cucuteni-Trypillia culture in general. The elaboration of a general image of the site facilitated the analysis of the structure and the manner of organisation of the prehistoric Cucuteni-Trypillia site from Petreni, recently published in a collective work (Rassmann et al. 2016 (Figure 7). This study constitutes a model of validating the non-invasive methods, which can also be applied to other prehistoric sites, as was the case with the settlement from Stolniceni (Edineț district) in 2015 (Țernă et al 2016a). At the end of the joint research campaign, which lasted for almost the entire month of October 2010, the representatives of the German Archaeological Institute held a conference in front of colleagues and students from the Pedagogical State University, presenting the preliminary results of the investigations carried out. The first preliminary results were published in Moldovan journals, and are pending publication in Germany (Popa et al 2010a; 2010b). In this way, the activity of the working group represents a logical continuation of the collaboration between the 'Ion Creangă' Pedagogical State University from Chișinău and the German Institute of Archaeology, by implementing a modern technology of non-destructive investigations of archaeological sites, in conjunction with training future users of this technology in the Republic of Moldova within the framework of the MA programmes in History and Cultural Heritage. Between 2010 and 2015, the History and Geography Faculty of the 'Ion Creangă' State Pedagogical University of Chișinău (Moldova), the Roman-Germanic Commission of the German Institute of Archaeology in Frankfurt am Main (Germany), and the National Museum of the Eastern Carpathians in Sfântu Gheorghe (Romania) developed the project on the settlements from the area between the Prut and Dniester rivers: the Cubolta valley in northern Moldova. The archives of the national museum contain information on c.275 sites on the slopes of the Cubolta valley or in the vicinity of it. Most of the sites are burial mounds (tumuli), followed by settlements of the Neolithic Cucuteni-Trypillia culture and of the late Roman Sântana de Mureș-Chernyakhov culture. The breakdown of the sites is as follows: there are 204 kurgans/tumuli, 70 settlements (of which 25 belong to the Sântana de Mureș-Chernyakhov culture, 35 to the Cucuteni-Trypillia culture, five to the Bronze Age, and four to the Middle Ages), and one graveyard (Catacomb culture). 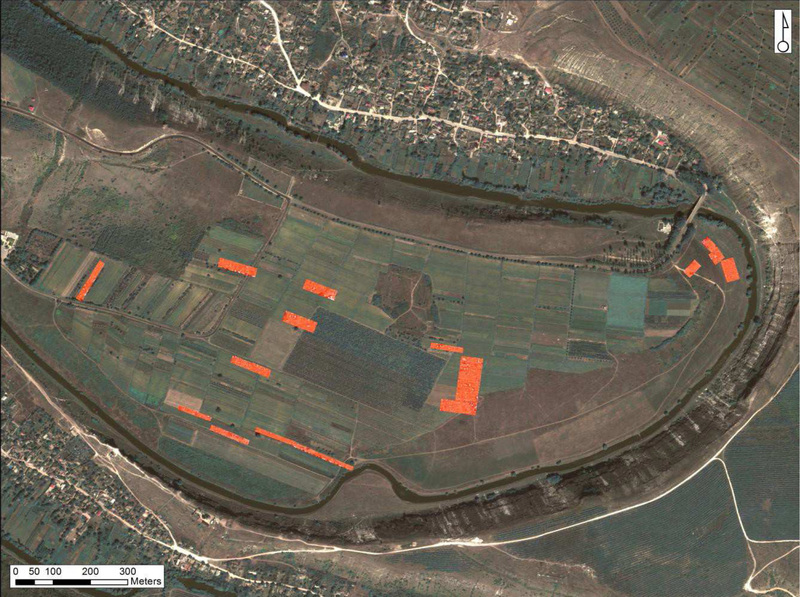 At the edge of the Cubolta valley, between the villages of Putinești (Florești district) and Mîndîc (Drochia district), inside a 39km-wide area, we have surveyed 38 areas with a total of 6.29km2. Material has been collected and charted from 17 sites. There are the Neolithic sites from Hăsnășenii Mari (settlement, Precucuteni culture), Gribova and Dominteni (settlement, Cucuteni-Trypillia culture) in Drochia district, and the sites of the Sântana de Mureș culture from Putinești in Florești district, Mărășești and Cubolta in the Sîngerei district, and Moara de Piatra, Hăsnășenii Mari, Drochia and Mîndîc in Drochia district. The location of the Neolithic Cucuteni-Trypillia sites is particularly interesting as they co-existed with the 'mega settlement' from Petreni, Drochia rayon (Musteață et al. 2013). However, the most important discovery to date is the settlement area of the Sântana de Mureș-Chernyakhov culture between the villages of Putinești and Cubolta in the southern part of the valley. Here we were able to survey three settlements, as well as part of the surrounding territory. A view from the south-west gives an impression of the largest settlement area, which extends over about 1250m on the eastern slope of the valley. In most cases nothing was found on the opposite side of the valley. The settlement stretches along a tract of land that is on average 80m wide. There are 14 sherd concentrations that are between 78 and 191m apart. Perhaps they represent the remains of farmsteads that were approximately 150 to 350m² in size. About 84% of the Sântana de Mureș-Chernyakhov ceramics (862 sherds) collected in Putinești consists of wheel-made pottery; the proportion of black and decorated ware (glazed ware, fine ceramics) is less than 1%. Remains of amphorae, which were imported from the Roman Empire, account for 1.4%. However, in the settlement of Budești the proportion of hand-made ceramics is only 1%, and the proportion of Roman pottery is 1.8% (Musteață et al. 2013, tables 1–3). North of the settlement area at Hăsnășenii Mari, where there is also a settlement of the Precucuteni culture (4800–4500 BC), finds of the Sântana de Mureș-Chernyakhov culture have also been made, probably the remains of a settlement. The feature is interesting because the spatial superimposition of a Neolithic and a late Roman settlement seems to be an exception in the area under investigation. A view from the north-west shows the area of the settlement on the south side of the valley with the typical black soil. In addition, a selection of the characteristic ceramics can be seen. As mentioned above, Neolithic occupation in this part of the Cubolta valley is very interesting because of the 14-acre Cucuteni-Trypillia 'mega-settlement' from Petreni, situated only 7km to the west, in a side valley. There, geomagnetic prospecting produced evidence of about 550 concentrically arranged houses (Popa et al 2010a; 2010b; Musteață et al. 2013). In the central part of the Cubolta valley there seems to have been a further settlement area of the Sântana de Mureș-Chernyakhov culture at a site near the village of Mîndîc. The situation here is reminiscent of the settlement at Putinești, but prospection of the area is not yet complete. The spectrum of the ceramics is similar to that from other sites, and hand-made pottery is often related to prehistoric settlements. During the summer of 2015, investigations were undertaken in a late Roman/early Migration Period settlement of the Sântana-de-Mureș Culture (c.AD 230–430/450) on the southern slope of the Cubolta Valley at Putinești, Florești district. The site is part of an area of settlement some 9km long on the eastern edge of the Cubolta valley, an area intensively settled in prehistoric times (Neolithic, Bronze Age). The Late Antiquity settlement is known from previous field walks and geomagnetic surveys as well as from aerial photogrammetry. Remains of the pottery-kiln, for specialised production of the characteristic wheel-made pottery, was detected during the geomagnetic prospection and documented in drill profiles (Voß et al. 2015a). The archaeological site discovered near the village of Putinești (Florești district) is at c.3.5km from the mouth of the Cubolta River, along a SE–NW direction. The site rests on a slope slightly inclined to the west, is of an elongated shape and is delimited on the northern and southern sides by gullies. Despite the unfavourable conditions created by the erosion of soil on the slope, as well as by the fill of a gas pipeline that crosses the site in its northern part in an east–west direction, it was possible to survey an area of c.82,000m². A series of magnetic anomalies was identified, which correspond to archaeological complexes of various shapes and configurations, the functions of which will be clarified by future research. A clear identification is of a kiln in the central part of the site, whose magnetic anomaly covered an area at least 5m long. This complex was documented by extracting soil samples using a core drill. Most probably it is a kiln with a fire chamber located under the burning chamber, separated by a clay 'membrane', similar to those found in Budești (near Chișinău) and Voitenki (Kharkov region, Ukraine). The search for the settlement's associated necropolis was unsuccessful; the search took place in the area of two tumuli located north-west of the settlement, but no surface materials or magnetic anomalies were identified here (Musteață et al. 2016) (Figure 8). 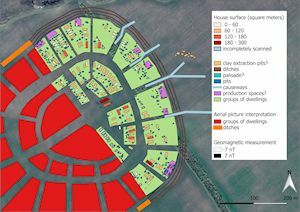 The following results were obtained from the investigation of the site from Putinești: information about the location, size and structure (settlements, cultivated areas) of the settlement areas in relation to the landscape (location factors); the relation between prehistoric (Neolithic) and protohistoric (Late Antiquity) settlement clusters; the structure of the settlement (farmsteads); and the elaboration of studies on the settlements' pottery: ratio of the types of wares, proportion of fine ceramics, imported pottery (Voß et al. 2015b). The medieval fortress of Soroca is one of the most known and visited cultural sites from the Republic of Moldova. 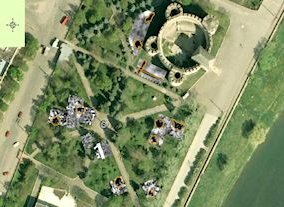 The local public administration initiated a restoration project of the fortress as a part of the cross-border project entitled 'Medieval Jewellery: Hotin, Soroca, Suceava Fortresses', financed by the European Union under the Joint Operational Programme Romania–Ukraine–Moldova. Between 2012 and 2015, researchers from the 'Ion Creangă' State Pedagogical University, the National Museum of History of Moldova, and the Cultural Heritage Institute of the Academy of Sciences of Moldova, in partnership with the National Museum of the Eastern Carpathians from Sf. Gheorghe, Romania and the 'Al. 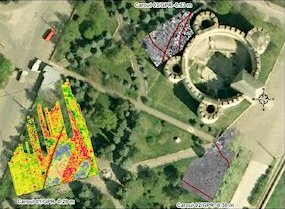 I. Cuza' University of Iași, Romania, carried out archaeological surveys inside and outside the fortress, using a range of techniques and methods: magnetometry, archaeozoology, soil analysis, etc. (Musteață 2015). The first stage consisted of a topographic survey of the area around the fortress and of the fortress development plan, using a total station and high-precision GPS. Taking into account the traces of late medieval buildings around the old fortress shown on old maps (ditches, fortress vallum, church, cemetery, etc.) and the current configuration of the park, in order to verify them and identify their location, a number of non-invasive techniques were applied. In view of the fact that the 'Ion Creangă' State Pedagogical University is equipped with only a magnetometer, in order to assure a multilateral approach, the team of the Arheoinvest Platform from the Interdisciplinary Research Department of the 'A. I. Cuza' University of Iași was invited to take part in the investigations. Thus, measurements were with a soil electrical resistivity system, ground-penetrating radar and caesium vapour magnetometer. The data obtained from the fluxgate gradiometer, together with the data provided by the team from Iasi, were processed in a GIS environment (Figures 9-10). The anomalies were charted and the areas of archaeological potential were highlighted. 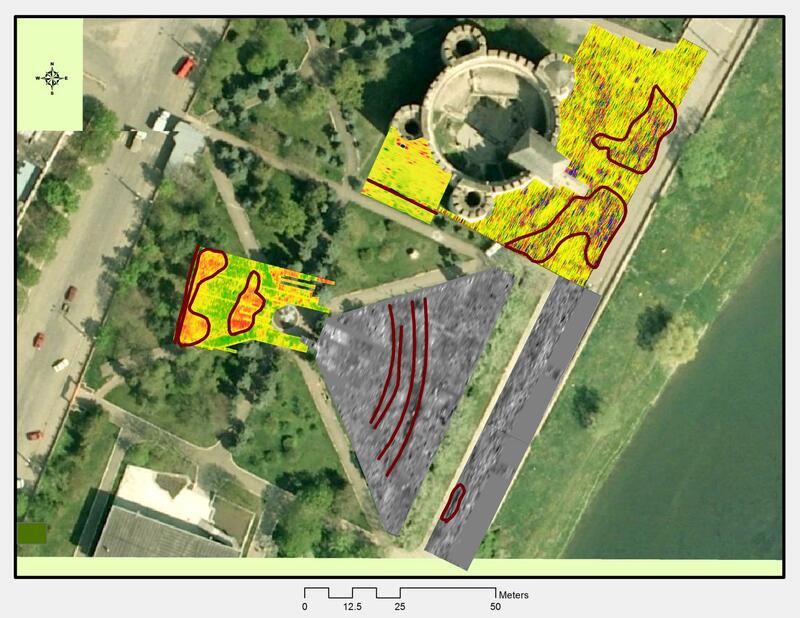 Non-invasive geophysical surveying close to the Soroca Fortress proved to be difficult because the area around the fortress underwent various interventions and reconfigurations, especially during the building of the present-day park. Some sectors were levelled by depositing soil up to a thickness of 2m, while in other sectors the soil was completely removed (Figures 11-12). Notwithstanding these hurdles, the geophysical surveys revealed anomalies in several sectors during the archaeological investigations, which proved to be structures of various historical periods. These results were made possible by the close collaboration of people from different areas and with different expertise, which showed that only with a common approach can we solve various problems specific to projects concerning historical monuments (Asăndulesei et al. 2015). The team of archaeologists from the Ion Creangă State Pedagogical University, Republic of Moldova was in partnership with colleagues from Romania. In 2010, the Arheoinvest research team from the Al. I. Cuza" University of Iași, Romania, carried out geo-electrical surveys in Saharna–Țiglău, aiming to identify the remains of the necropolis in a strip of crop land. Extensive investigations were also carried out in the same year in Saharna Mare, including GPR, magnetometric, 3D scanning, fluxgate, and georeferenced topographic surveys. After 2010, small-scale works only (topographic survey, GPS corrections) were carried out in Saharna Mare (Andrei Nicic, pers. comm). The team from the 'Al. 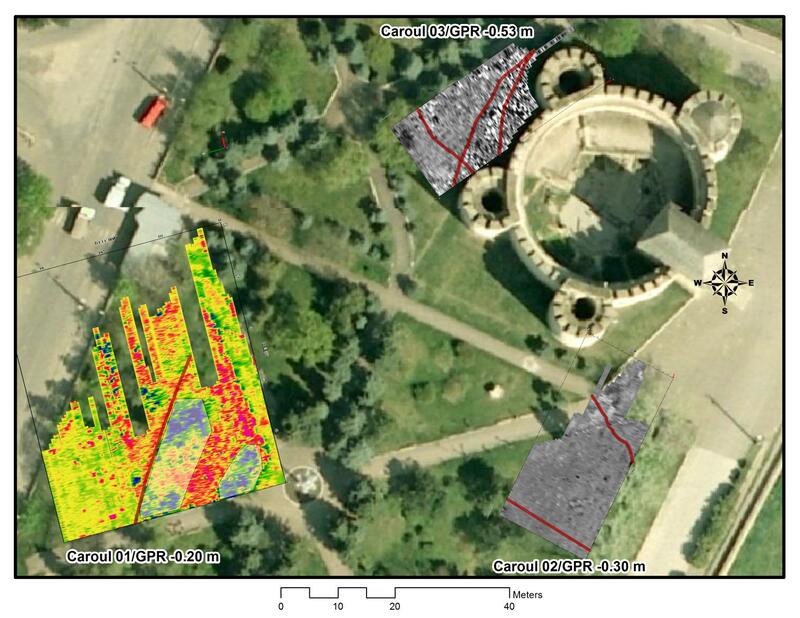 I. Cuza' University of Iași, Romania, also carried out a geophysical survey of the Lozova archaeological site in 2010, but without notable results. In 2015, investigations were made in Saharna Mare and Saharna––La Șanț–, the results of which have not yet been published (Andrei Asăndulesei, pers. comm.). The Arheoinvest team used a Geometrics G858 caesium magnetometer, because it is 'one of the fastest and most productive' (Niculiță et al. 2012). Many anomalies were discovered in the area of the ancient hillfort, such as the remains of the defensive ditch and wall or other constructions, later confirmed by excavations (Figure 13). Dan and Magdalena Ștefan carried out non-invasive research in a fortified Iron Age enclosure from Stolniceni, specifically magnetometric surveying of an area of c.1ha inside the enclosure; the results have not yet been published (Andrei Corobcean pers. comm.). 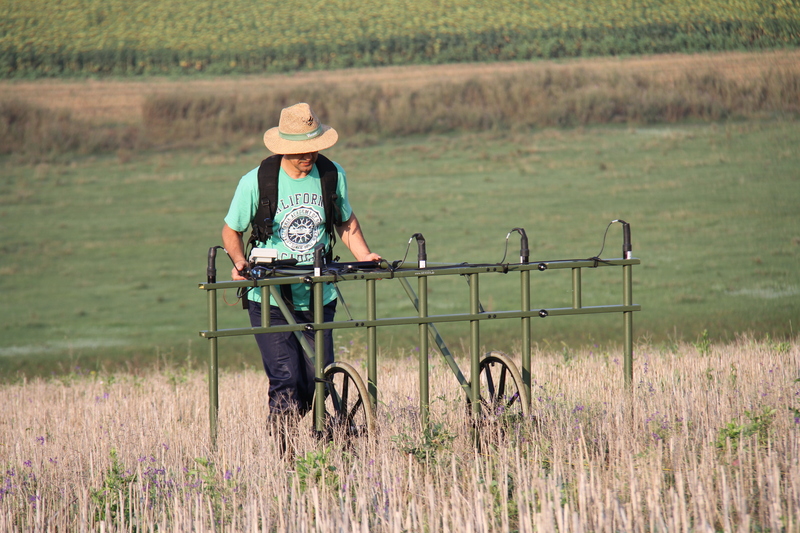 Another Moldo-German team (High School of Anthropology, the National Museum of Moldova and RGK/DAI) carried out a geophysical survey in Stolniceni (Edineț district), a prehistoric site known since 1970. The investigations took place during the summer of 2015, in the form of magnetometric surveying of a 23ha area, out of a total of c.33ha. The survey led to the discovery of the remains of c.140 dwellings, c.280 pits, and a defensive system composed of three ditches enclosing the settlement (Figure 14). These are very promising results, and the authors intend to extend the investigations to the rest of the settlement (Țernă et al. 2016b). 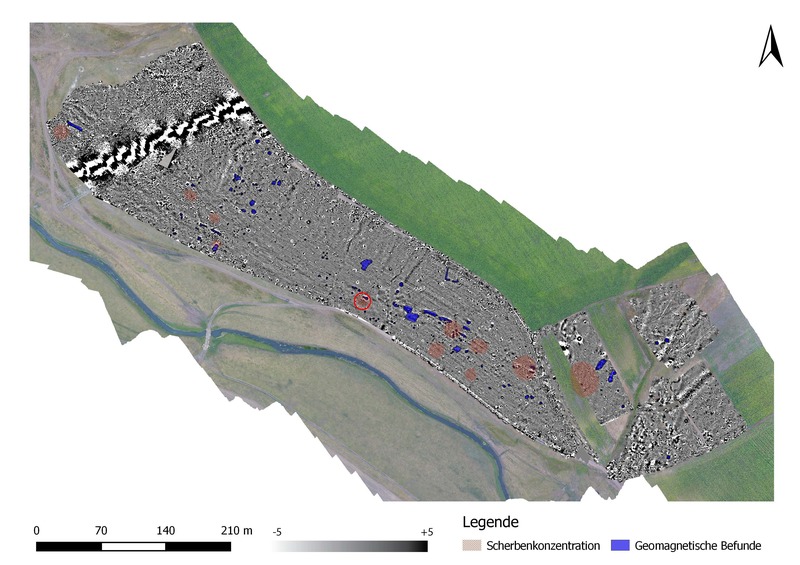 In 2014 the American College of Cultural Site Research and Management (CSRM) from Baltimore, USA, employed the lidar technique on the site of Orheiul Vechi, nominated for the World Heritage List. Lidar has revolutionised archaeological studies in recent years and is becoming increasingly popular for remote prospecting and discovery of new archaeological remains. 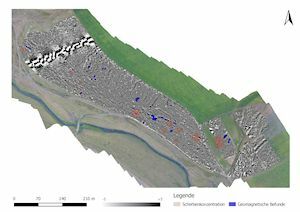 Lidar and multispectral data analysis of Orheiul Vechi revealed numerous archaeological structures and landscape features, many of which were not previously known, such as traces of an ancient hillfort on the Butuceni promontory. At the same time, the structure of another partially known Mășcăuți ancient hillfort was established (Comer 2014) (Figure 15). 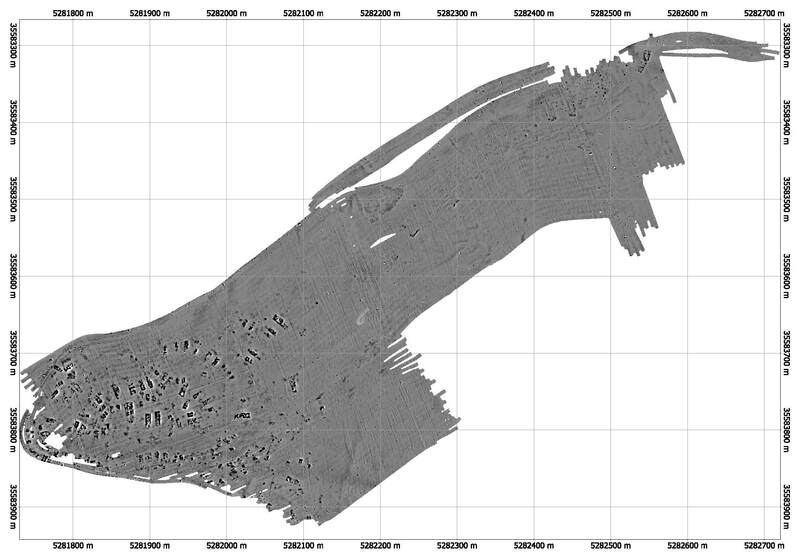 Figure 15: Orheul Vechi – the lidar survey results. The red circles indicate the remains of the hillforts (after Comer 2014). The results of the non-invasive investigations undertaken during the last decade in the Republic of Moldova confirmed the presence of a number of already known archaeological locations and facilitated new discoveries, which warrants their future investigation. The extension of the partnerships with colleagues from other countries would ensure the transfer of experience and knowledge of modern methods of archaeological research, since a multidisciplinary approach and the involvement of international teams are the surest route to quality research. The use of non-destructive research methods in archaeological projects in the Republic of Moldova is in line with international conventions sanctioning the use non-destructive techniques and in situ conservation of archaeological traces. We would like to express our gratitude to Andrei Nicic, Andrei Asăndulesei, and Andrei Corobcean for useful information while writing this article. This work results from a presentation given at the 17th Heritage Management Symposium, 'Digital Archaeological Heritage', Europae Archaeologiae Consilium (EAC), 17–18 March, 2016, Brighton, UK, and supported by a grant from the Romanian National Authority for Scientific Research, CNCS–UEFISCDI, Project, 'Current trends in the archaeological heritage preservation: the national and the international perspectives', PN-II-ID-PCE-2011-3-0610. Aitken, M.J. 1961 Physics and Archaeology, New York and London. Asăndulesei, A., Tencariu, F.-A., Balaur, R.-S. and Asăndulesei, M. 2015 'Prospecțiuni geofizice non-distructiveîn proximitatea cetății Soroca' in S. Musteaţă (ed) Cetatea Soroca – istorie, memorie și tradiții seculare, Materialele conferinței, Soroca, 4-5 aprilie 2013, Seria 'Istorii și Documente Necunoscute – IDN', C5. Chișinău: Editura ARC. 48-57. Comer, D.C. 2014 Orheiul Vechi Landscape Analysis. Discussion Document v. 3, CSRM Foundation, 27 December. Dudkin, V.P. and Videkko, M.J. 2004 'Planuvannja poselen' trypil'skoji kul'tury (Планування поселень трипiльської культури)', Enciklopedia trypil'skoji cyvilizaciji (Енциклопедia трипiльської цивiлiзацiї), Київ. 304-14. Keiser, E. and Sava, E. 2006, 'Ausgrabungen an einer Gruppe von 'Ascherhügeln' in Moldawien', Archaeologia Circumpontica 4, 3-6. Musteaţă, S. (ed) 2015 Cetatea Soroca – istorie, memorie și tradiții seculare, Materialele conferinței, Soroca, 4-5 aprilie 2013, Seria 'Istorii și Documente Necunoscute – IDN', C5, Chișinău: Editura ARC. Musteaţă, S., Popa, A. and Voß, H.-U. 2013 Raport știinţific privind rezultatele sondajelor arheologice din valea râului Cubolta din anul 2012. Chișinău. Musteaţă, S., Popa, A. and Voß, H.-U. 2016 Raport ştiinţific privind rezultatele sondajelor arheologice din valea râului Cubolta din anul 2015, Chișinău. Niculiță, I., Cotiuga, V., Zanoci, A., Asăndulesei, A., Băț, M., Romanescu, G. Tencariu, F.-A., Balaur, R., Nicu, C. and Caliniuc, Șt 2012 'Magnetometric prospections in the Thraco-Getae fortress from Saharna Mare, Rezina District, Republic of Moldova' in V. Cotiuga and Șt Caliniuc (eds) Interdisciplinarity Research in Archaeology. Proceedings of the First Arheoinvest Congress, 10-11 June 2011, Iaşi, Romania, Oxford: British Archaeological Reports International Series 2433. 87-92. Popa, A., Musteaţă, S., Bicbaev, V., Rassmann, K., Munteanu, O., Postică, G. and Sîrbu, G. 2010a 'Rezultatele preliminare privind sondajele geofizice din anul 2009 şi perspectivele folosirii magnetometriei în Republica Moldova' in S. Musteaţă, A. Popa and J.-P. Abraham (eds) Arheologia între ştiinţă, politică şi economia de piaţă, Culegere de studii, Seria IDN, C1, Chişinău: Editura Pontos. 145-57. Popa, A., Musteaţă, S., Bicbaev, V., Rassmann, K., Munteanu, O., Postică, G. and Sîrbu, G. 2010b 'Consideraţii privind sondajele geofizice din anul 2009 în Republica Moldova', Revista Arheologică, VI(1), 171-79. Popa, A., Musteaţă, S. and Voß, H.-U. 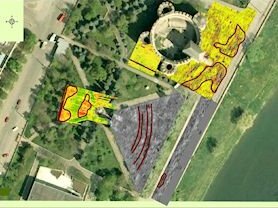 2012 'Landscape archaeology şi prospecţiuni magnetometrice în Republica Moldova: rezultate şi perspective ale unui proiect moldo-german', Akademos. Revistă de ştiinţă, inovare, cultură şi artă 1(24), 102-8. Popa, A., Musteaţă, S. and Voß, H.-U. 2013 'Prospecţiuni magnetometrice în Republica Moldova: rezultate şi perspective ale unui proiect moldo-german', Zargidava. Revistă de istorie XII, 251-63. 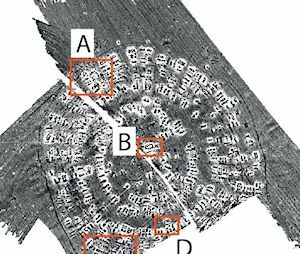 Rassmann, K., Mertl, P., Voß, H.-U., Bicbaev, V., Popa, A. and Musteaţă, S. 2016 'Copper Age settlements in Moldova: insights into a complex phenomenon from recent geomagnetic surveys' in J. Müller, K. Rassmann and M. Videiko (eds) Trypillia Mega-Sites and European Prehistory 4100-3400 BCE, London-New York: Routledge. 55-70. Schmidt, A., Linford, P., Linford, N., David, A., Gaffney, C., Sarris, A. and Fassbinder, J. 2015 EAC Guidelines for the use of Geophysics in Archaeology: Questions to Ask and Points to Consider, EAC Guidelines 2, Namur, WAC: AISBL. Țernă, S., Rassmann, K., Vasilache, M., Radloff, K. and Sîrbu, M. 2016a Raport științific privind investigațiile geofizice din microzona Stolniceni din anul 2015, Chișinău. Țernă, S., Rassmann, K. Vasilache, M. and Radloff, K. 2016b 'Stolniceni I – new research on a Cucuteni-Tripolye large site' in Honorific Volume for E. Sava, Chișinău. 41-52. Voß, H.-U., Musteaţă, S., Popa, A., Burgel, D. and Kalmbach, J. 2015a 'Putineşti, Raionul Floreşti – eine Siedlung der Sântana-de-Mureş-Kultur im Norden der Republik Moldau. Ein Vorbericht', Plural. History. Culture. Society 3(2), 7-16. Voß, H.-U., Musteaţă, S. and Popa, A. 2015b 'Forward-looking for conservation. Case study: landscape archaeology in the Cubolta River Valley, Republic of Moldova – the project "Cultural relations of the Sântana de Mureș Culture between the Rivers Prut and Dniester"' in S. Musteaţă and Șt Caliniuc (eds) Current Trends in Archaeological Heritage Preservation: National and International Perspectives. Proceedings of the international conference, Iași, Romania, November 6–10, 2013, Oxford: British Archaeological Reports International Series 2741. 21-26.